The score craze inspired by the render duping discoveries has still not died out yet, it seems. D_tea has now claimed the Score world record for the third time (his second post-duping world record), with an incredible score of $6,625,575, an improvement of $18,950 over the previous record by Kinnijup. The run is chock-full of exciting moments, so let’s jump right into the summary! Aside from teleporting into an arrow trap which very nearly threw him into spikes, the run gets off to a very smooth start on 1-2 for everyone’s favorite cyclops. With a jetpack, mattock, udjat, and altar gloves, this stereotypical score start had everything except bombs (foreshadowing, perhaps?). With a 1-3 altar, d_tea was able to obtain the kapala and still anger Kali a first time to prepare for some early ball-and-chain strats (which ended up not happening) . Aside from a gem-rich 1-3, it is not until 1-4 that we really start to see this run take off. With a second snake pit and a vault, this is the perfect environment to do some early render duping. Consistently pulling off difficult ghosting tricks with relative ease, he took advantage of conveniently placed pushblocks to dupe the vault for a total individual level score of just under 300k. Entering the jungle with a near fresh mattock, Tea’s low bomb count is not a pressing issue. Tea also locates the Black Market entrance in the bottom of 2-1, allowing an early resource boost. One interesting choice is that d_tea chose to break the pots by whipping or throwing them to save a bomb (which turned out to be very useful later on). As some of the old-timers know, d_tea has been infamous for getting very low-bomb count BMs. Unfortunately, this streak continues with a skimpy 9-bomb Black Market. However, not all is lost! A very fortunate hired help save at the beginning of the level allowed Tea to begin implementing the powerful HH dupes much earlier that expected. Although it did cost him a few bombs in the later levels to create safespots, the money gained by taking advantage of early HH dupes far offset the resource cost. After skillfully dispensing with the shopkeepers, tea collects the money and exits the level $100k richer. Tea makes short work of the next two levels while taking full advantage of his early lead by attempting to dupe nearly every gem, and using clever bomb placement to have a guaranteed vault HH dupe in 2-3. D_tea exits the jungle 6 bombs, $422k, and 1 HH richer than he entered. One major disadvantage for Tea entering the Ice Caves is his lack of a mitt, which makes finding safespots considerable harder. He does manage to make one in 3-1 by manipulating a UFO into mining a hole (right in the middle of the level, which leads to some scary ghosting), and uses similar strats in 3-2. D_tea opts to anger Kali once again, and ends up Ball-and-Chaining the rest of 3-1, breaking the $1 million benchmark. Dealing with the ghost, a HH, and the BnC all at the same time is no mean feat for even the top score runners. 3-3 is another action-packed level, featuring a vault, a shop, the Moai, and even some more Ball-and-Chaining (this time with a perma-ghost). After an attempted dupe on the vault (which did not work to full efficiency), tea continues on to 3-4. Not needing the HH anymore, as he’ll get the robot in the Mothership anyway, tea “disposes of” (read : brutally sacrifices) his now-unneeded teammate. After a predictably explodey Mothership, our hero exits with a powerful alien explosive weapon and a robot programmed to murder anything it sees (what could go wrong?). A convenient early safespot in 3-4-2 allows tea to enter the Temple after an astonishing $740k Ice Caves. 4-1, considered by many score runners the trickiest (or at least most stressful) level in the game, goes relatively smoothly for d_tea, as he quickly finds a 2-bomb safespot and disposes of Anubis. 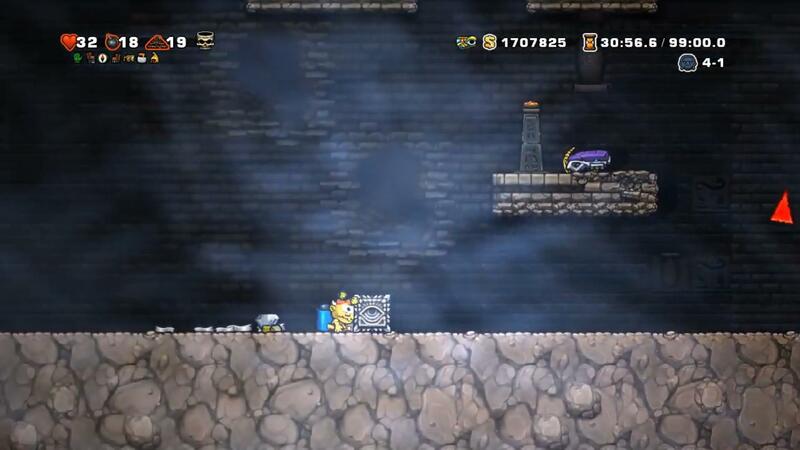 Tea manages to rack up an astounding $1.18 million in this vault level by performing his signature thwomp dupe. After another million dollar dupe in 4-2 (a Kali pit level), tea enters the legendary City of Gold just a tiny bit under the previous world record. Despite having a lavafall and some unfortunate mummy wrappings, tea performs a series of HH dupes to collect an impressive $1.38 million, the most profitable level in the run. The boss Olmec proves to be no match for our orange cannon-wielding friend, as he systematically destroys all of Olmec’s lair and steals its riches (including 9 bombs, the same measly amount tea obtained in the Black Market), and he enters Hell well above the $5.5 million mark. Hell, however, claimed its first victim as the suicidal robot dramatically threw itself onto spikes early in 5-1. Tea, however, continues on despite this tragedy and manages to rake in the money on the later Hell levels, taking in $650k between 5-2 and 5-3 (including collecting nearly $380k in 5-2, despite a lavafall)! D_tea finishes up the end of the run in strong form, dispatching the Lord of the Underworld with ease before stealing his wealth and exiting in just over two and a half minutes. With a final score of $6,625,575, d_tea secured the world record by $18,950.